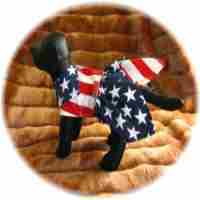 This Americana Dog Sweater with American Flag is by Zack and Zoey patriotically features the American Flag. The Americana Dog Sweater with American Flag is a warm knitted dog sweater with wide ribbed turtleneck, sleeves and hem. Topping off the design are leg straps and a high cut, stay dry belly.